As summer cools to an autumn brisk, fish regain their ambition. It's not that they need to fatten up for winter; their cold-blooded metabolisms don't require layered protection against the coming freeze. A fish's fall is a season for growing, and aquatic predators exchange a summer smorgasbord of insects and other crawlers for things that flee! By mid to late September, smallmouth bass in the Delaware River are much less likely to poke about for a leech than to attack much more lively, delicious, and nutritious shad fry. Trout in the Paulinskill River no longer retreat to cool feeder springs to avoid water temperature spikes. Lake Hopatcong begins to "turn over" as the surface cools and oxygen begins to permeate the depths. Even walleyes, which prefer cooler water than bass, begin to stir by late September. With a reinvigorated neighborhood, fish need to conserve less oxygen, leaving plenty of power to pursue their main objective in life: to get bigger! 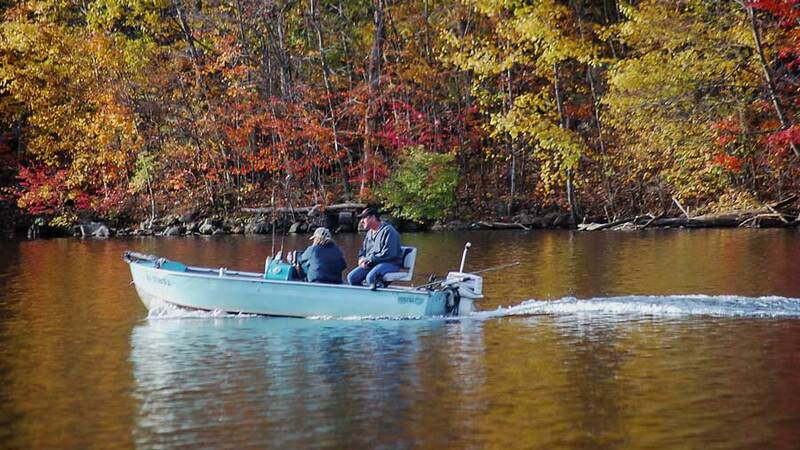 Monksville Reservoir is a great place for walleye, bass, pickerel, and muskies in the fall. 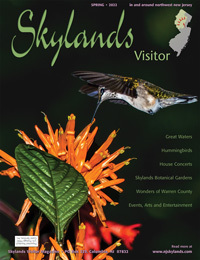 Every Skylands waterway that offers good fishing is especially worthwhile from late September through October. Trout, walleye, pickerel, hybrid stripers, and muskies continue to provide very good fishing through November and into December. The fall trout stocking in major rivers such as the Paulinskill, Musconetcong, Pequest, Black, and the Raritans, attracts fly fishermen using hare's ear nymphs, small stonefly patterns, and tiny zebra midges. Other anglers lure trout with fathead minnows, baby nightcrawlers, or spinners when rain stains water clarity. Floater/diver plugs by Rapala, Rebel, and other lure manufacturers come into their own in September for smallmouth bass, and become especially effective in October for fishing farm ponds that contain no fish forage besides bluegills. A month prior, the only lure that would work was a big, ugly black plastic worm barely moved on bottom. As late as mid-November, smallmouths eagerly take live shiners in streams. In the fall, vertical jigging is the coolest way to catch lake walleye, is very effective for hybrid stripers, and also tempts a few large crappies and smallmouth bass. Use a Rapala Ice Fishing Jig or Gotcha Jigger directly over the side of the boat straight down, drifting along rocky drop-offs 20-45 feet deep. The rocks are the key, and vertical jiggers pay acute attention to what they feel as the jig descends. The lure's motion is up and down—lift and drop—rather than through the water. In summer, big bodies of water like Lake Hopatcong, Swartswood Lake, Canistear Reservoir, Greenwood Lake, and Monksville Reservoir become oxygen-depleted. Gamefish are in exile; strung out and just trying to make it to the months when they can really enjoy life again. When an Ice Jig comes banging around the rocks in the fall, big fish love to associate with it, and the result is a swift and merciless strike. Vertical jigging may be the premier method of catching large gamefish on lures through the entire fall season—walleyes hit jigs through December and through the ice in winter as well. But musky trollers may disagree. Specialized and expensive as trolling is, amazing fish over four feet long and as heavy as forty pounds reward these efforts throughout fall. 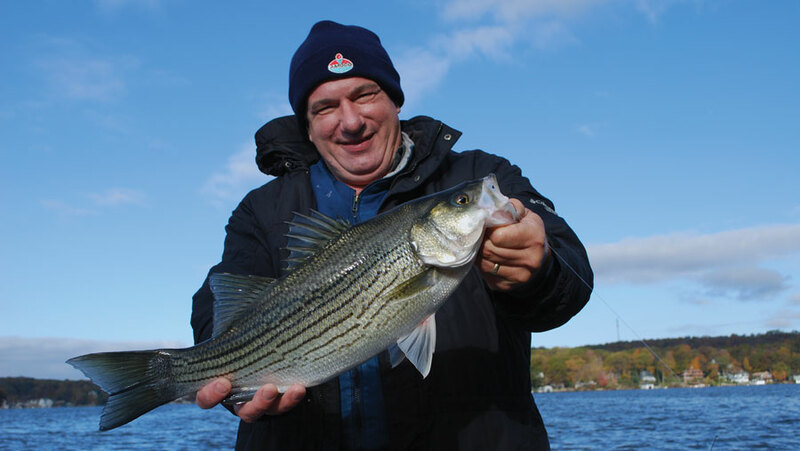 A fine hybrid striper caught on live herring at Lake Hopatcong. For others, fall is the season for live bait. Brown and rainbow trout at Merrill Creek and Round Valley Reservoirs take live herring drifted ten to fifteen feet deep, although a few boaters insist on trolling artificials. Use downriggers for lake trout, trolling fifty to seventy feet deep. Everyone seems familiar with marshmallow and mealworm rigs. The small marshmallow floats a size six, plain shank hook and mealworm three or four feet off bottom on a six pound test leader tied to a barrel swivel with a 1/2 to 3/4 ounce sliding steel egg sinker on the main line. Place the bait ten to thirty feet deep and fish with multiple rods if possible. Don't overlook salmon eggs if you come out for rainbows that cruise in close to shore beginning in mid-October. Fish a single salmon egg on a size fourteen hook, three feet under a bobber in ten or twelve feet of crystal clear Round Valley water around a length of shoreline. Rainbows will come and grab the eggs, meeting them halfway. Shiners may be best mid-November and later when browns become prevalent and even some lake trout swing in close. Don't think that trout near shore are necessarily small: the record brown trout catch at Round Valley—21 pounds, 6 ounces—was caught from shore. Nothing seems to tempt bass like a nightcrawler given a Worm Blower treatment. Worm Blowers have air-line needles attached to a one ounce plastic container like those used for reel or bicycle lube. Just press on the container to inject air into a nightcrawler on a size six, plain shank hook with a medium tin split shot eighteen inches up the line. The nightcrawler floats, wiggling, in plain view. My son calls this his "secret weapon" and makes outstanding catches. 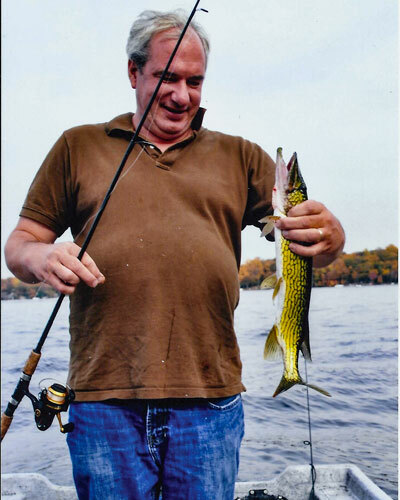 Typical Lake Hopatcong October pickerel close to twenty inches slammed a smal jig baited with a dead herring. Through the fall, pickerel gain respect that peaks with ice fishing. Still, some regard pickerel as so savage a predator as to be avoided by the excuse that they are too easy to catch. Either these anglers have no experience with topwater plug-shy pickerel that swipe by lures a dozen times before taking, or they refuse to acknowledge a pickerel's selectivity and subtle temperament. Nature made no mistake evolving the pike family so close to the taxonomic order of trout and salmon—Salmoniformes—that only recently pike and mudminnows are distinguished in the separate order of Esociformes. Pickerel are thought to be shallow water fish, period. But we catch them twenty feet deep in Passaic County's Shepherd Lake, and the especially big ones may be ten feet down or deeper in fall. While topwater plugs, spinnerbaits, and Johnson Silver Minnow spoons remain effective through October over and among aquatic vegetation, shiners live-lined or attached to jig heads attract energetic strikes into December. When using live herring for walleye and hybrid stripers on Lake Hopatcong in late October and November, we keep expired herring to spend an hour or so at afternoon's height to catch slammer pickerel along the outside edge of weeds eight to fifteen feet deep by quick jigging with 3/8 to 1/4 ounce heads. The chief reason I prefer shiners and herring for pickerel in the fall perhaps has less to do with bait's sheer effectiveness than the aesthetic of its use. To use live bait is to participate ecologically, to experience responses which in fact cannot be enjoyed by using artificial lures manufactured in a remote factory. Live lining is essentially simple: a bucket of shiners, size six plain shank hooks, small barrel swivels, and if pickerel are present, fifteen pound test fluorocarbon leader material between hook and swivel. The idea is to let the shiner swim, while slowly guiding it by retrieve. This weightless presentation of live shiners is for shallower water, down to about ten feet. Pickerel shoot from sticks, take shiners, and run for about five yards to stop. Wait no more than ten seconds for the pickerel to turn the shiner head first so the hook will set in the mouth, removable, and the fish can be released without injury. Bruce Litton writes on various subjects, having fished primarily in New Jersey for over forty years. More at his blog.